The seated chest press machine is an upright version of the standard lying bench press machine. The arms, placed under a weight-bearing load, are pushed away from the chest and returned to starting position. The chest press helps build the pectoral muscles as well as the biceps, deltoids, and latissimus dorsi muscles. This exercise targets the main muscle of the chest, the pectorals. Developing the pecs is an aesthetic goal for many people. It is also functional in developing strength and power for sports where you swing a bat, racket, or club. The chest press machine also recruits the biceps and the big muscles of the shoulders and back. Using a machine helps prevent many errors of form. You can adjust the seat and handles so they are in the correct position for your body. Using a machine, you are able to lift heavier weights with more control. Familiarize yourself with the machine. The standard Nautilus machine is a levered device which uses a set of removable weight plates. Older machines have a single weight carriage that distributes the weight equally between the two bars. Newer levered models have a carriage for each bar and an independent movement that builds both sides of the chest more equally. Others machines work on a cable-and-pulley system that attaches to a stack of weight plates. To adjust the weight, you would simply move the removable pin to the selected plate. As with levered systems, cable-and-pulley machines can either have independent or non-independent bars. If you are unfamiliar with any of these machines, don't hesitate to ask a gym attendant for help. Sit comfortably on the machine with your feet placed firmly on the floor about shoulder-width apart. 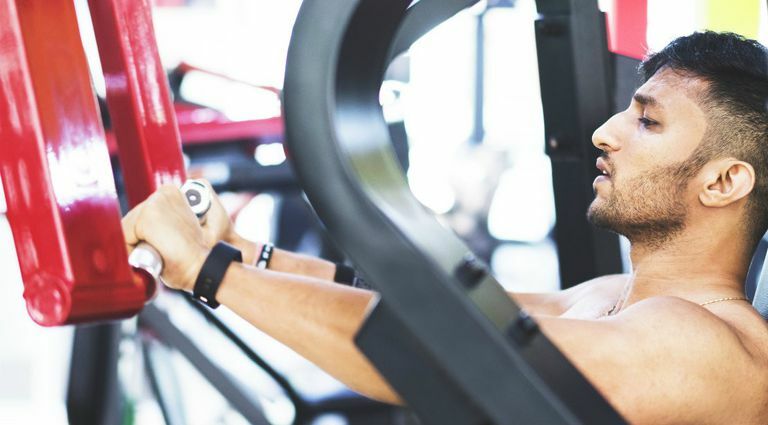 If this is your first time using the machine, place a lighter load on the weight carriage. If your machine has an adjustable seat height, ensure that the setting allows your arms to push at a horizontal position to the ground when your arms are fully extended. Grasp the handles with a full grip, thumb circled around the handle, and maintain a neutral wrist position with your wrists in line with your forearms. Push the bars outward to full extension but without locking out the elbow, exhaling as you press out. Keep your head steady against the upright pad and your neck still. You should feel significant resistance against the horizontal push. Pause briefly at full extension, then allow the bars to return toward your chest and breathe in during this recovery. Repeat for as many repetitions as called for in your program. Try different weights until you are able to push and release slowly for about 10 repetitions. The last repetition should always feel a bit difficult. Try three sets of 10 reps. Start with less if you have to, always listening to your body to avoid injury. Rest for a few minutes between sets. Avoid these errors so you get the most benefit from this exercise and avoid injury. Don't stress your shoulder joint by extending your elbows too far back when grasping the handles. A little is OK, but the handgrips should always be in front of your body line. Injuries can easily occur if you hyperextend the shoulder while bearing even moderate weight. Very often the machine is designed so it has a catch that won't allow this overextension. Check to ensure it has been set correctly. When pushing the bar, your movement should never be explosive. Keep your movements steady and controlled, both as you push and release. If needed, count "one-two" when pushing, pause, and then count "one-two" as you release. Never rush. Keep your back and shoulder blades against the back support. If you find yourself arching your back when you push, you are using too much weight. Reduce the weight so that you can push with effort but without arching the back. When using a machine, you are limited in the different ways you can perform an exercise, but there are modifications you can make. When first starting, be sure to study the machine and how to adjust the seat and handles. Ask for assistance from the gym staff if necessary. Use a light weight or even an unweighted effort at first to check your positioning. Then add small increments of weight until you reach the amount you can press for eight to 12 reps with good form. As you build muscle, you will be able to increase the weights used. You can also experiment with using a different grip. However, if you use too wide of a grip your range of motion will be shortened, lessening the training effect. Once you have good form, try unilateral chest presses with one arm at a time. If you are an advanced exerciser with good core stability, you can sit upright with your back off the backrest as you do the chest press. However, you must check that you are not rounding the back. The same exercise can be performed on a bench using either a barbell or a pair of dumbbells as well as on a cable machine. As each will have a slightly different action, it is good to vary your chest press routine. Talk to your doctor or physical therapist about whether this exercise if appropriate for you if you have had an injury to or recent surgery involving your chest muscles or shoulders. If at any time you feel pain in your arms, shoulders, or chest, end the exercise. Be sure to take the time to adjust the machine to fit your torso and arm length. Ensure that you have set the levers to prevent overextending your elbows and shoulders. Check the weights selected so you aren't lifting an extreme amount.